The windmill palm tree is not only a super addition to almost any landscape but is also one of the most cold hardy palms available. It’s a favorite of landscapers and gardeners who want a tropical feel but live in colder climates. There are actually 2 varieties that are so closely related that some consider them the same species and others have them named differently. It really depends on who you talk to. 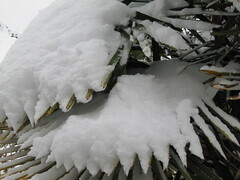 The other names are Chinese windmill palm and chusan palm for the trachycarpus fornunei. The one classed scientifically as the trachycarpus wagnerianus often goes by the miniature chusan palm and a nick name of waggie palm. The miniature chusan actually has not been found in the wild anywhere. It was first discovered as a cultivated variety in Japan. The thoughts are that they actually cultivated only windmill palms with specific characteristics to develop the kind of tree they wanted. Both types have the same growing and care info, but the miniature version is a bit smaller. Not really a mini tree as the name implies. The windmill palm tree and it's close relative have very similar appearances as you may have already guessed. The miniature chusan is just smaller in all aspects. They have medium green, deeply segmented leaves 3 ft across for the larger and 2 feet for the smaller. The mini version also has a stiffer leaf presentation that stands up to high winds much better than its relative. They both have old leave bases attached to the trunk that also is covered with a brownish/grayish mat of fibers. The trunks will get to be around 8 inches thick on both but the fibers make it look much thicker. These palms do get both flowers and palm fruit/ seeds on them. Male trees will get yellow flowers in a branching display. These will not produce fruit. Occasionally there will be flowers that are of both sexes on the same tree. These flowers will look like the male but be larger than normal. If this happens you will get fruits. 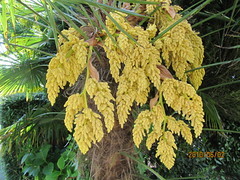 Female trees have flowers that are more of a green than yellow color and will produce the small fruits. They will be a bluish black once ripe and oval in shape. New ones can be grown from seed fairly easily on both varieties and fresh ones will usually germinate in about 3 months. These beautiful palms are grown as far north as Vancouver British Columbia, Ireland, England some spots in Russia and reportedly even in the panhandle of Alaska. The name of Chinese windmill palm is because the original comes from mainly the central China region at altitudes that can get fairly cold and damp. Younger trees will need some protection, like being covered while temps dip to lower than -8°C. If you take a bit of extra care with them when they are young, you’ll have a tough mature tree that will take care of itself when temperatures get colder. Even with mature trees, you can cover them when temps get even lower than the ones stated above. This will offer them greater protection from being burnt by the cold. Some have survived as low as -27°C so it’s a great possibility for many areas to the north. The windmill palm tree is a medium grower while the mini version is considered slow, so you could even have either as a potted palm in their younger years. Then just bring them in when it’s at its coldest outside. With the fan type leaves- don't forget to protect the potted ones from the wind. They will grow in full to part sun or part shade and are both moisture and drought tolerant. In overly hot locations they should be in part sun/shade if at all possible. They can stand the overly wet climate of places like England and Vancouver, but can also go a bit on the dry side for short periods. 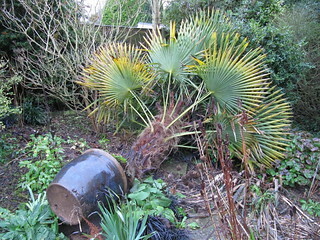 The windmill palm tree and miniature chusan palms are quite versatile. They can grow in most types of soil as long as it drains fairly well. They will thrive with regular watering and palm fertilizer every 3-4 months or so. They aren’t very susceptible to deficiencies or pests, so the overall care of them is fairly easy. The larger is only very slightly prone to lethal yellowing. They require a bit of pruning- just mainly the fronds that are turning more brown. Leave yellowing ones until they turn color. This little bit will help unsure your windmill palm stays looking its best. Trim close to the trunk so that the left over pruned end doesn’t stick out too much. The ends can be sharp because the leaves are very tough. They have been used for making ropes and other cloth like items where strength is required. If you buy either of windmill palm tree and it is being shipped from outside your country, there's a good chance that the fibers and old leaf bases will be stripped from the trunk. This is done as a precaution to stop the possibility of insect hitchhikers. As we know from experience now, they may not have predators and could become an evasive species. Better safe than sorry. Want to put a little slice of tropical paradise in your northern backyard? Consider adding a windmill palm tree of either type to your landscape or container garden. Planting gives you best practices to get your tropical specimen off to the best start. Large , medium, small varieties, and the cold hardy types list the trees in each category to help you find the perfect one for your landscape situation. For indoors we have the best indoor palms and a selection of artificial ones. 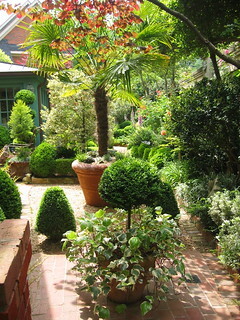 Landscaping with palms helps you find the right tree for that special spot in your yard. Identification helps by discussing what areas of the tree to look at when trying to determine what species it is.